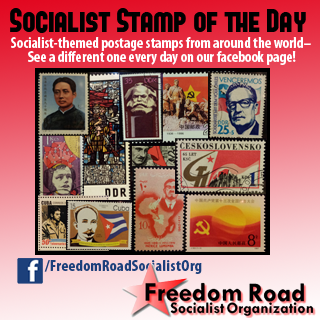 Freedom Road begins ‘Socialist Stamp of the Day’ on Facebook | Fight Back! Minneapolis, MN - On Sept. 1, Freedom Road Socialist Organization’s Facebook page will begin a new feature: “Socialist Stamp of the Day.” Every day a socialist-themed postage stamp will be posted. This is part of an ongoing effort to utilize social networking to creatively promote socialism and the heroic struggles and victories of the socialist countries. The Freedom Road Socialist Organization Facebook page has become increasingly popular for its “Today in History” feature. This consists of a daily photo and blurb about events that happened each day in the history of the working class and oppressed peoples’ struggles. Freedom Road’s Socialist Stamp of the Day will be another creative way to learn about the socialist movement, past and present. Many people throughout the world study and collect postage stamps. Stamps are admired for both their artistic and historical significance. Freedom Road’s “Socialist Stamp of the Day” will promote the artistic and historical contributions of socialist countries (and also some socialist-themed stamps from non-socialist countries) through the medium of their postage stamps. 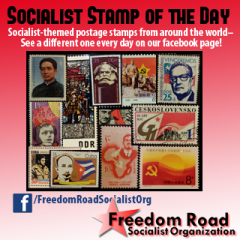 People can follow the “Socialist Stamp of the Day” by liking Freedom Road’s Facebook page at facebook.com/FreedomRoadSocialistOrg.